Carbohydrate Chemistry provides review coverage of all publications relevant to the chemistry of monosaccharides and oligosaccharides in a given year. The amount of research in this field appearing in the organic chemical literature is increasing because of the enhanced importance of the subject, especially in areas of medicinal chemistry and biology. In no part of the field is this more apparent than in the synthesis of oligosaccharides required by scientists working in glycobiology. Clycomedicinal chemistry and its reliance on carbohydrate synthesis is now very well established, for example, by the preparation of specific carbohydrate- based antigens, especially cancer-specific oligosaccharides and glycoconjugates. Coverage of topics such as nucleosides, amino-sugars, alditols and cyclitols also covers much research of relevance to biological and medicinal chemistry. 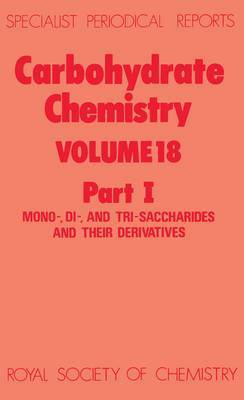 Each volume of the series brings together references to all published work in given areas of the subject and serves as a comprehensive database for the active research chemist Specialist Periodical Reports provide systematic and detailed review coverage in major areas of chemical research. Compiled by teams of leading authorities in the relevant subject areas, the series creates a unique service for the active research chemist, with regular, in-depth accounts of progress in particular fields of chemistry. Subject coverage within different volumes of a given title is similar and publication is on an annual or biennial basis.